An artist’s impression of Royal Pearls ... majestic. Work is progressing at a steady pace on the Dh21-billion ($5.7 billion) Royal Pearls luxury project being developed by Oriental Pearls Real Estate Developers at Meydan community in Dubai, UAE. With nearly 10 per cent of Phase One already completed, the project is well on its way for completion by 2022, says the developer. Enveloped in its cocoon of landscaped features and greenery, Royal Pearls is designed as a residential haven at a vantage point in the Meydan Development in Nad Al Sheba and with easy access to four major highways – Al Ain Road (E66), Sheikh Mohammed bin Zayed Road (E311), Al Khail Road (E44) and Emirates Road (E611). Offering smart, networked and ultra-modern living spaces in a pristine, upscale location within easy reach of key urban hotspots and centrally located in a serene residential setting, Royal Pearls is a one-of-its-kind project. The 4.6-million-sq-ft masterplanned development has close to 8,000 choice freehold apartments. 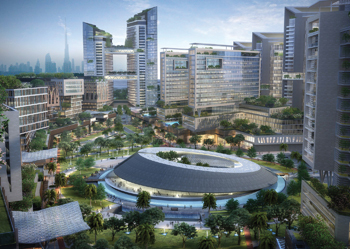 At the hub of the Meydan Development, the community is precisely engineered to offer superior living spaces, surrounded by swathes of greenery as well as interspersed with leisure and entertainment facilities, says the developer, adding that it is an oasis of serenity, conveniently located within reach of the city’s business, financial and entertainment hubs. On the project’s progress, Jarrar says till date, the enabling work for the first 12 towers has been completed and the anticipated completion for all units is scheduled for November 2019. “The community has been designed to offer residents a multitude of well-planned facilities set out across key locations of the masterplan. Royal Pearls has carefully curated all its amenities throughout the smart community in keeping with the needs of contemporary living,” he notes. At the heart of Royal Pearls will be a unique and ultra-modern community centre, surrounded by water features, and a beautifully landscaped park. Residents and visitors alike will enjoy a wide assortment of state-of-the-art attractions and leisure offerings including cafes, restaurants, a 55-seater private theatre, daycare centre, multifunctional hall, spa, salon, bowling alley, squash courts and a massive fitness centre.